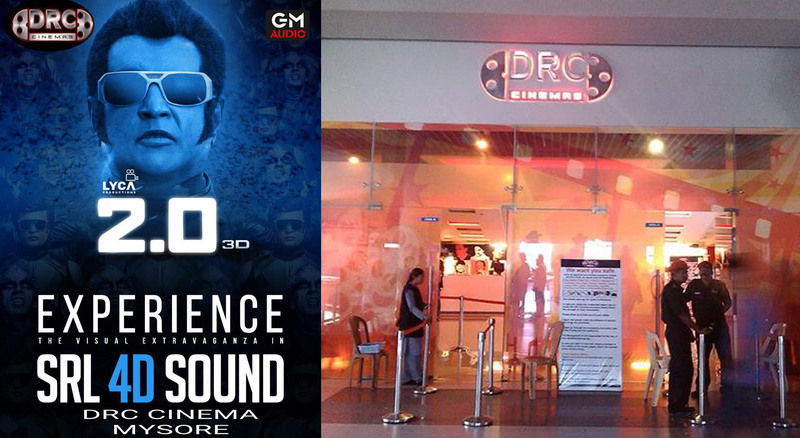 Bangalore, 28th November 2018: DRC Cinemas, Mysuru is showered with audience pouring in; being the first ever multiplex to pull down the curtains for the mega sci-fi blockbuster 2.0 with SRL4D Sound in the state of Karnataka. The city’s first ever multiplex is now beaming with delight as the movie-goers wait to have an experience of the most talked about SRL4D sound technology in its screens. The much-anticipated movie of 2018, starring Rajinikanth, Akshay Kumar and Amy Jackson had already captured the attention of movie buffs with its intriguing teaser and trailer released. However, apart from its fantastic visuals as the audience poll claims, the sound of the film has also struck the audience with wonder and great excitement. Though the film released in 2D and 3D, the sound used for the film is in 4D. The SLR4D technology used in the film has raised standards high to give the audience ‘a never imagined experience on the whole’. This innovative and world renowned sound technology has been introduced through this film in India for the very first time. Director Shankar, Oscar-winning sound designer Resul Pookutty and Lyca Productions have teamed up with tremendous efforts only to surprise the movie-goers on a whole new level. The new age technology of 4D sound has been used for the first time in the world for this mega Sci-fi thriller 2.0. On usual grounds, the surround sound system consists of speakers on the ceiling and on either side of the walls. But this innovative sound system will have the speakers being placed right under the seats to give a realistic and immersive viewing experience for the audience. DRC Cinemas, having already upgraded the interiors of all screens to include recliners and Dolby Atmos; the projectors in two of its screens to 4K from the existing 2K; Giving a massive 30k resolution on screen giving the visuals at their sharpest, DRC Cinemas is certainly leaving no stone unturned to see that cinema viewing experience in Mysuru is on par with the best. Specialising in the latest technology, GM Audio from Chennai has been the consultant for DRC’s effective audio installs which has maintained vast market leadership by supplying premium products in the industry.